When you think of St. Andrews, most people think of the university, golf courses and picturesque beaches. That is, until now. 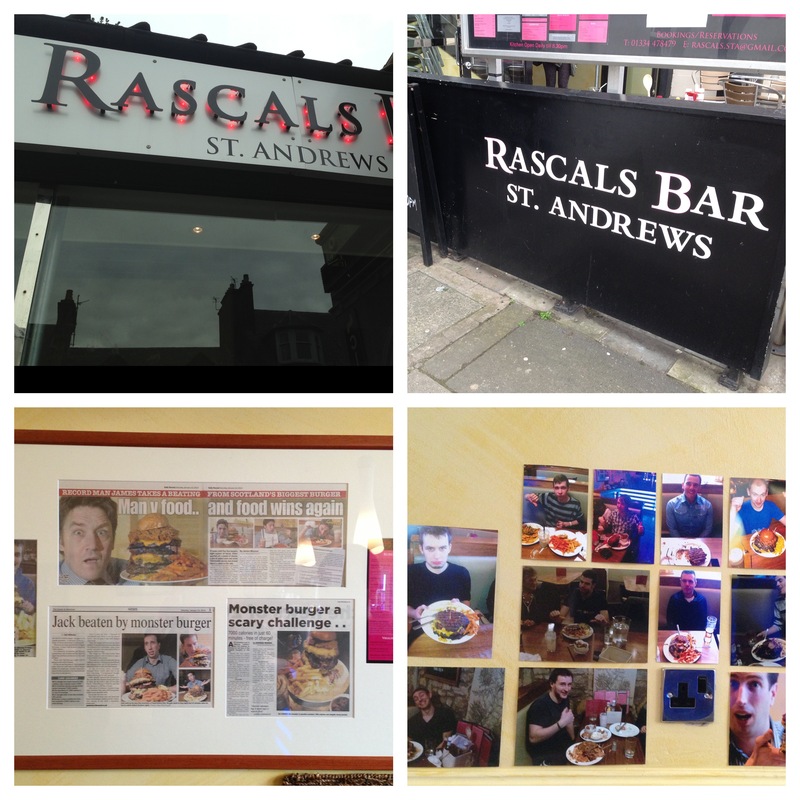 Rascals Bar, located on North street, is attempting to inject their love for burgers and for television shows such as Man vs. Food into the community and they have done so in the form of serving up some of the biggest, most gut-busting burgers in the country. Their biggest challenge, the ‘Poppa’s Revenge burger’ consists of five 12oz patties, 8 slices of bacon, cheese and pulled pork on a brioche bun and served with fries, salad, liquid magma chicken wings and a giant milkshake. Eat it all in an hour or less and it’s free, otherwise it’s £30. To date, nobody has defeated it. Not really being in the mood for dying before the age of 30, we decided to instead sample a few of the regular burgers from the menu. Since it’s not every day that we drive all the way to St. Andrews, we decided to bring along a friend so that we could try more than two burgers and review as much as we possibly could. Inside, Rascals is bright and airy and is actually connected to the cinema that sits next door, hence the movie quotes and posters that decorate the walls throughout. There’s also a wall of fame, for those who have finished the previous food challenges and a wall of shame, for those who have failed. The process is simple – grab a table, look at the menu, order at the bar. We opted for a pulled pork burger, described on the Rascals Facebook page as their biggest seller, along with a Sloppy Rascal and the burger of the week special, which was a pizza burger. 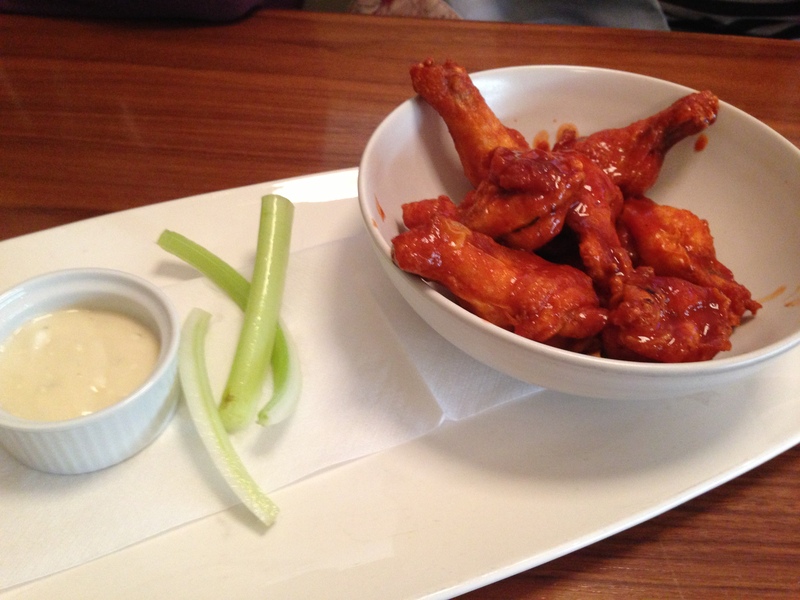 We also got a portion of Louisiana chicken wings to start us off but decided not to try the liquid magma sauce. Any customer who wishes to try the liquid magma wings must be 18 years old or over and sign a disclaimer before ordering. The chicken wings were a good way to start (although if I’d realised how big the portions were, I may have went straight to the burgers!). When I held a chicken wing to my mouth and took a breath, it sent me into a coughing fit. They gave off a very hot, yet managable flavour. They were hot, but not so hot that I was reaching for the water jug after a bite; however, by the time I’d had two or three, my mouth was starting to burn quite a bit. I have no idea how hot the Liquid Magma sauce is, but after experiencing how hot these were, I don’t know if I’d want to find out! 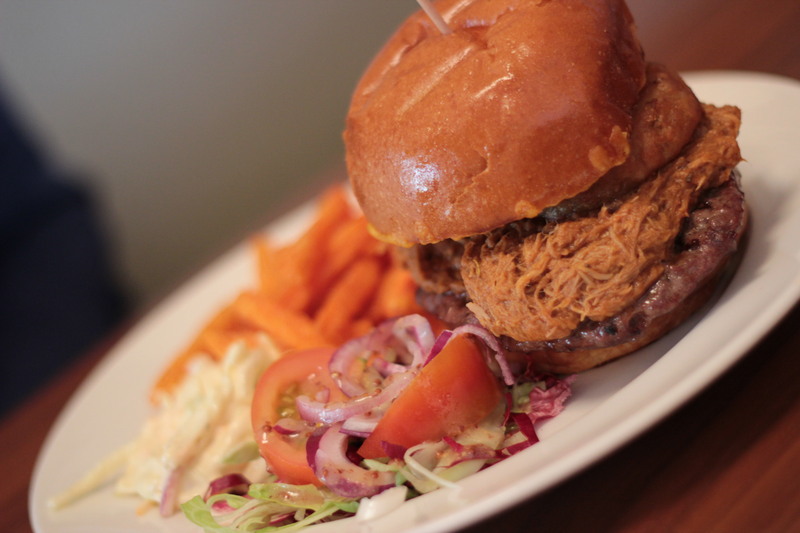 The pulled pork burger consisted of a 12oz patty topped with spicy BBQ pulled pork, melted cheese and giant onion rings on a toasted brioche. 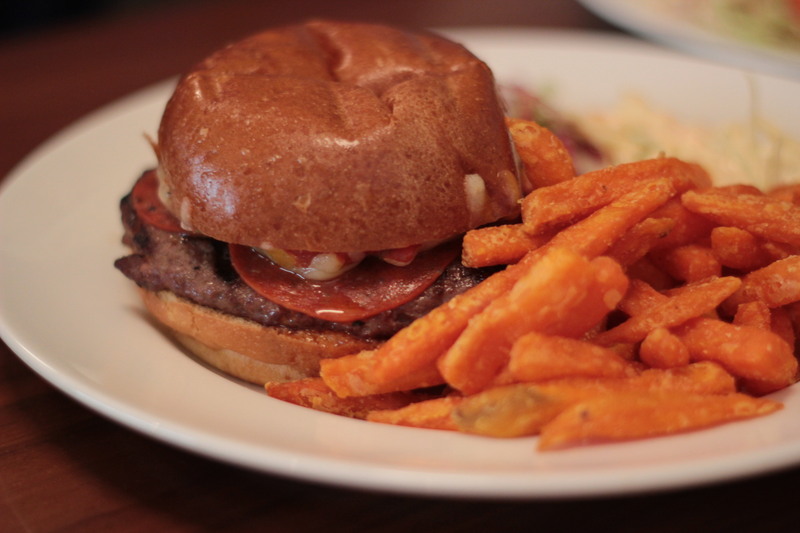 We chose the sweet potato fries over the regular fries too, as we absolutely love sweet potato fries and feel that not enough restaurants serve them with their burgers. The patty was juicy, delicious and well seasoned. It had a nice chargrilled flavour with very slight hints of pink throughout. The pulled pork had a nice, intense kick and was very tender. It’s spicy kick was balanced out by the melted cheese, which took the edge off ever so slightly. The onion rings were crispy, but not overpowering and simply worked well at adding some additional depth to a burger that already overflows with flavours. Despite a multitude of flavours, each one is represented well. The pulled pork is definitely the standout, but it doesn’t completely drown out the flavour of the beef and the cheese helps to hold everything together. The toasted brioche was fantastic too – light, fluffy, slightly sweet and perfect at keeping the burger together. 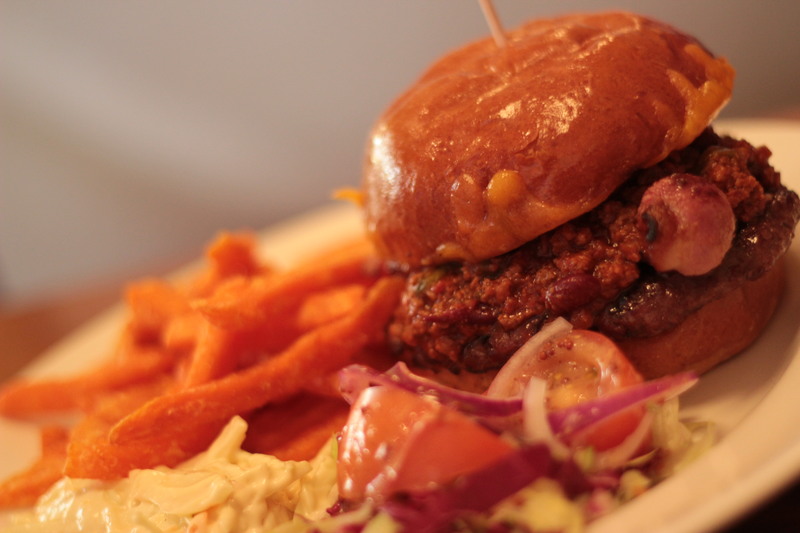 The brioche is used as standard on all of Rascals burgers too. 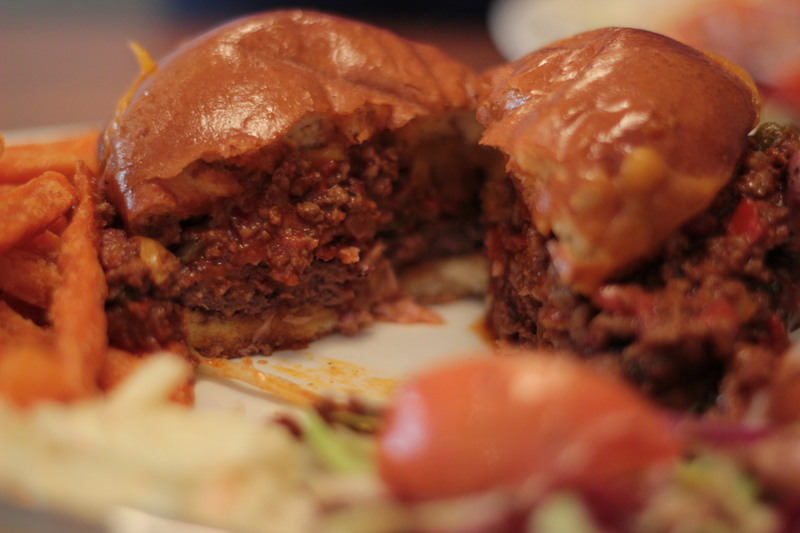 The Sloppy Rascal consists of a beef patty topped with Rascals homemade chilli, bacon, melted cheese and Rascal’s own signature sauce. It’s a burger that definitely earns it’s name as it may well be the messiest burger we’ve ever reviewed. After less than a minute into eating it, our hands were covered in chilli; however, when you order something called a ‘Sloppy Rascal’, you’re not going to expect anything less than messy. Again, the brioche does a good job of keeping it all together, but the sheer of amount of chilli is too much for even the best buns to hold. The Rascal’s signature sauce is delicious and overall, this was another strong burger; however, I think I’d have preferred slightly less chilli and a little more secret sauce, just to allow all of the flavours to be able to shine through. 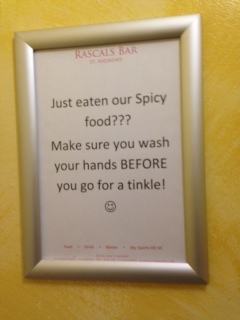 The chilli was excellent, but it did overshadow the Rascal’s sauce and the well cooked patty ever so slightly. The smokey, salty flavour of the bacon did meld well with the chilli though, to give it a nice smoked finish. I was very curious to try the Pizza burger. 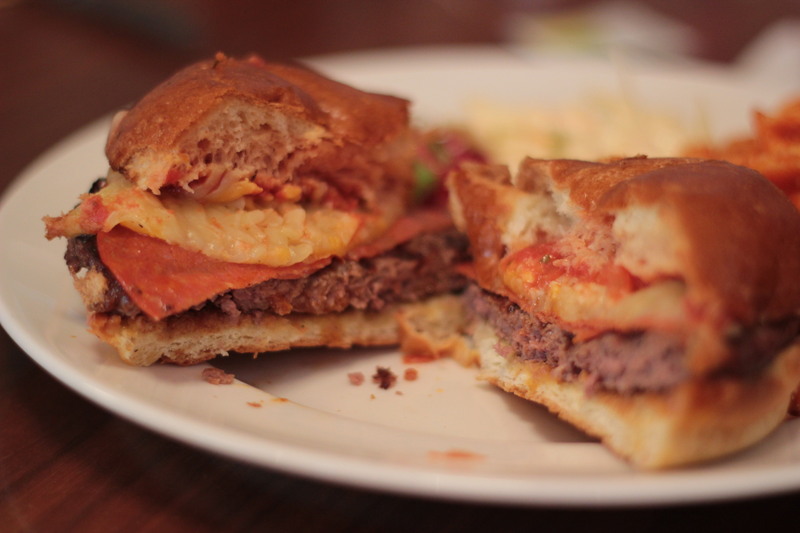 In New York, I’d tried something described as a Pizza burger many years ago at a tourist trap diner just off of Times Square; however, what I got was nothing more than a standard burger with floods of tomato sauce and cheese. Rascals Pizza burger on the other hand, consisted of a beef patty (a thinner one than the ones used on the pulled pork and sloppy rascal burgers), topped with pepperoni, spiced marinara sauce, basil, melted mozzarella and cheddar. Fortunately, it couldn’t have been further from the pizza burger I’d had in NYC in terms of taste. All three of us absolutely loved it because it simply tasted just like a pizza, if you imagine what a chargrilled beef burger pizza would taste like. The basil was definitely the key ingredient, which really gave it a very unique taste that was quite unlike any other burger we’ve reviewed to date. The pepperoni and two different cheeses, when melted into the brioche bun gave it a texture that was very reminiscent of a good slice of pizza; however, the chargrilled patty was a constant reminder that this was infact a very creative, well put together burger. The sweet potato fries that came with all of the burgers were fantastic. Light, crispy and cooked perfectly. I’d love to see sweet potato fries more widely available in Scotland as for us, they beat regular fries almost every time. I could have eaten another bowl-full, even though I was ready to burst out of my clothes by the time I had finished. 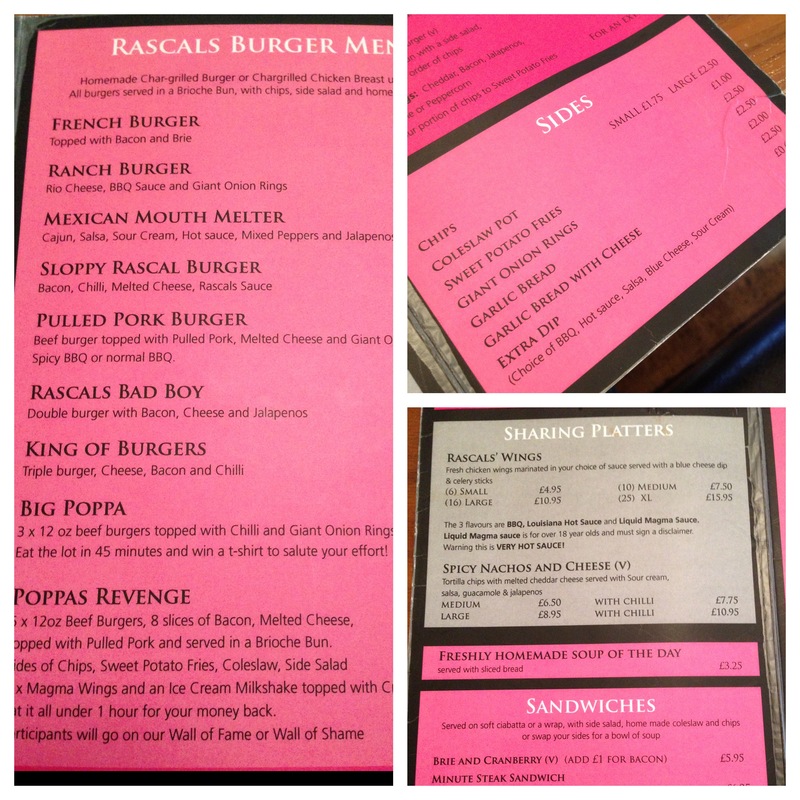 The guys at Rascals clearly love their food and have a passion for big, creative burgers. 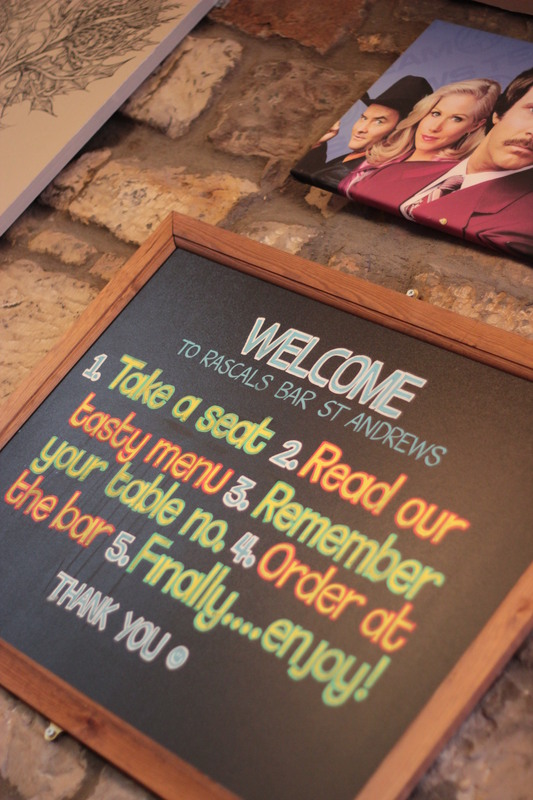 On a relatively quiet high street full of golfing equipment stores and guest houses, Rascals definitely stands out as being big, bold and different. The Man vs. Food influences are clear and you can tell that the menu has been put together with the best burgers from the US in mind. The burgers might be a little too messy for some, but it’s a small criticism on an otherwise fun experience. With a great gimmick in the food challenges, new creative specials each week and solid efforts like the pulled pork burger, I think it’s safe to say that if you’re after a burger in St. Andrews, this is the only place that should be crossing your mind. + Pizza burger one of the most unique, interesting burgers we’ve reviewed. – While it was still a good burger, the large amount of chilli on the sloppy rascal slightly overshadowed the secret sauce and the patty. Have you tried this burger? Did you love it? If so, vote for it in the ‘Glasgow’s best burger’ award by clicking here. 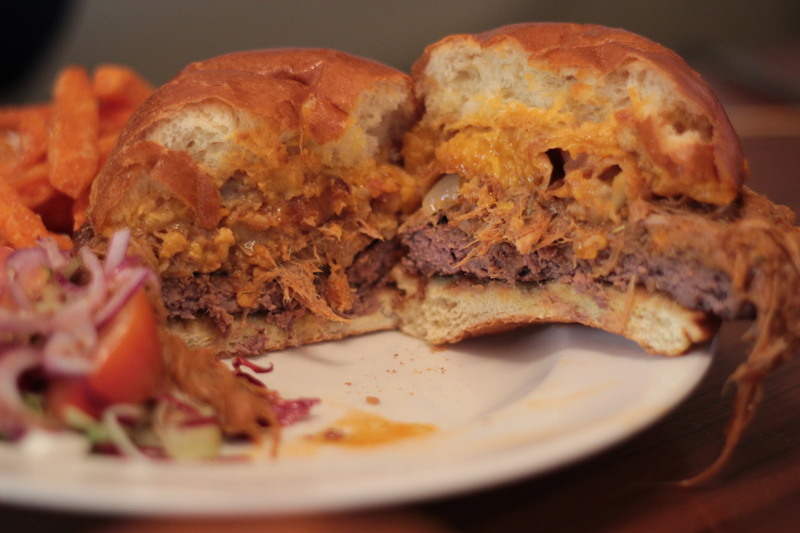 Talk to James on Twitter and tell us what you thought of this burger! You can also leave your own review and comments below. We want to hear from you! You can also leave a message or join in on the burger chat on our Facebook page. James vs. Burger Photography by Pamela Graham is licensed under a Creative Commons Attribution-NonCommercial-NoDerivs 3.0 Unported License. Based on a work at http://www.jamesvsburger.com. so i am just following you. Look forward to looking at your weeb page again.